This is the first Danish edition of Sacred Clowns that was published in 1995 by KLIM, in Århus, Denmark. 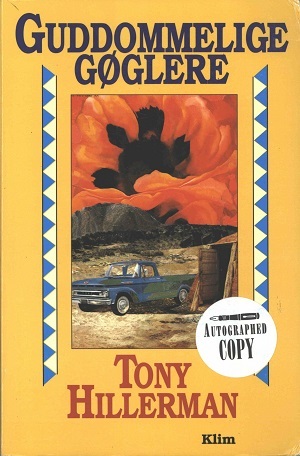 Tony Hillerman's original text was translated from English to Danish by Søren K. Barsøe. The title translates directly to "Divine Jesters". The cover art was illustrated by Nils-Ole Lund and features the image of a flower by Georgia O'Keeffe. Georgia O'Keeffe is a famous American painter who spent a majority of her career painting in New Mexico. The cover depicts a scene of a beaten up blue and green truck parked next to the entrance of a hogan. The background is distinctly southwestern with the incorporation of a mesa and barren landscape and beyond the mesa rim is the image of a flower painted by Georgia O'Keeffe. Format: Paperback, 21.5 x 14.2 cm. Binding: Full-colored paste boards with the author, title, and publisher printed vertically on the spine.